We’d love your help. Let us know what’s wrong with this preview of Hons and Rebels by Jessica Mitford. Jessica Mitford, the great muckraking journalist, was part of a legendary English aristocratic family. Her sisters included Nancy, doyenne of the 1920s London smart set and a noted novelist and biographer; Diana, wife to the English fascist chief Sir Oswald Mosley; Unity, who fell head over in heels in love with Hitler; and Deborah, later the Duchess of Devonshire. Jessica Jessica Mitford, the great muckraking journalist, was part of a legendary English aristocratic family. Her sisters included Nancy, doyenne of the 1920s London smart set and a noted novelist and biographer; Diana, wife to the English fascist chief Sir Oswald Mosley; Unity, who fell head over in heels in love with Hitler; and Deborah, later the Duchess of Devonshire. Jessica swung left and moved to America, where she took part in the civil rights movement and wrote her classic expose of the undertaking business, The American Way of Death. Hons and Rebels is the hugely entertaining tale of Mitford's upbringing, which was, as she dryly remarks, not exactly conventional. . . Debo spent silent hours in the chicken house learning to do an exact imitation of the look of pained concentration that comes over a hen's face when it is laying an egg. . . . Unity and I made up a complete language called Boudledidge, unintelligible to any but ourselves, in which we translated various dirty songs (for safe singing in front of the grown-ups). But Mitford found her family's world as smothering as it was singular and, determined to escape it, she eloped with Esmond Romilly, Churchill's nephew, to go fight in the Spanish Civil War. The ensuing scandal, in which a British destroyer was dispatched to recover the two truants, inspires some of Mitford's funniest, and most pointed, pages. To ask other readers questions about Hons and Rebels, please sign up. 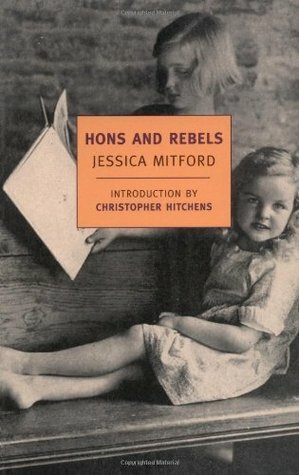 Does anyone or book club have discussion questions on Hon and Rebels by Jessica Mitford? Would appreciate your sharing. Thank you. I really enjoyed this book. One gets a different perspective of the Mitfords, a perspective from within. Jessica tells of her life and her family from her point of view. Events are told with immediacy, with a girlish gush of enthusiasm that feels thoroughly honest, genuine, youthful and engaging. I got a huge kick out of the humor in the book’s lines. Underlying the humor is a seriousness which provides food for thought. Before reading this book it is helpful to already be acquainted with the ba I really enjoyed this book. One gets a different perspective of the Mitfords, a perspective from within. Jessica tells of her life and her family from her point of view. Events are told with immediacy, with a girlish gush of enthusiasm that feels thoroughly honest, genuine, youthful and engaging. Before reading this book it is helpful to already be acquainted with the basics about the family. For that I recommend The Sisters: The Saga of the Mitford Family by Mary S. Lovell. It was very good, so I gave it four stars too. Having read that and so a solid groundwork to stand on, Jessica’s book gives the reader further insight into Jessica’s own character and her relationships with her sisters. Unfortunately the book stops too soon. It covers her privileged, aristocratic childhood, elopement with her second cousin Esmond Romilly, both only 19 years old and off to the Spanish Civil War. It concludes with the outbreak of the Second World War when Esmond leaves for Canada and Airforce Training Camp. She is pregnant for the second time. We are summarily told of Esmond’s tragic death which will soon follow in 1941. What I was given I thoroughly enjoyed, but I really did want more, more about the years to come and more about why the couple chose to go to America and not Russia! To me it seemed that many of their actions were inspired more by adolescent rebellion, naivety and a young lovers’ attraction rather than deep political beliefs. The audiobook I listened to is narrated by Jenny Agutter. It is based on the book’s 1989 edition which restores that which had been removed from the original 1960 edition. The narration is excellent. I adored the different inflections used for Americans and Brits. I fastened on this at a liberry sale I went to recently, remembering that some fellow LTer was on a Mitford Girls kick. I was inspired to buy it by its ten cent price and also its ghastly, 60s-Penguin "artwork" cover. I like that it says "3/6" for a price, so exotic and incomprehensible. And also, The American Way of Death made a **huge** impression on me as a boy, so I wanted to know more about Miss Mitford. So Jessica tells us the tale of someone born into privilege, luxury, and uselessness, who finds all of these qualities completely intolerable and who cannot, cannot, cannot endure the idea of the life that is laid out before her. She doesn't know what she believes, but she's sure it's not what her family believes. I fell in love with her right then and there. I felt the same way. Jesus, racism, and conservative politics made me nauseated, as they did my eldest sister. So Jessica Mitford, Girl Rebel, looks for a way out: Her cousin Esmond, a professional rebel with a published book and a troublemaking newspaper founded and run before he was 16, fit the bill. She spends a year finagling an introduction to him, suprisingly difficult because she's so sheltered and he's so disreputable; but once it happens, it was the proverbial match to gas! I adored Esmond as much as Jessica did, and I adored Jessica as much as Esmond did. I cried when they lost their first daughter so unnecessarily; I cheered when they got to own that bar in Miami; I sat numbed by the enormity of Jessica's loss when Esmond died when he was 23, fighting against the Fascists he'd hated all his life, whether Spanish, English, or German. I am so glad that I finally read this book that's as old as I am, being published in 1960. (My copy isn't that old, it dates from 1962.) It's very instructive to be reminded that youth isn't necessarily wasted on the young. Like J.K. Rowling, I worship Jessica "Decca" Mitford. If I had a daughter, I'd name her after Jessica, who was born into an aristocratic family, ran away with her hunky Communist cousin to fight in the Spanish Civil War, emigrated to the United States without a penny, and became a muckraking journalist with no formal schooling. My mouth was agape the entire time I read HONS AND REBELS...it seemed incredible that Mitford's story wasn't fiction. She devoted her life to fighting fascism, even while Like J.K. Rowling, I worship Jessica "Decca" Mitford. If I had a daughter, I'd name her after Jessica, who was born into an aristocratic family, ran away with her hunky Communist cousin to fight in the Spanish Civil War, emigrated to the United States without a penny, and became a muckraking journalist with no formal schooling. My mouth was agape the entire time I read HONS AND REBELS...it seemed incredible that Mitford's story wasn't fiction. She devoted her life to fighting fascism, even while 2 of her sisters became close associates of Adolf Hitler. Don't get me wrong, though. I don't love Jessica for her political convinctions -- I love her for her writing talent. Funny, sarcastic, and playful, she is a forerunner to Michael Moore. Witty and smart -- but maybe a little lacking in heart. It's hard not to like Jessica Mitford. She was born into a world of aristocratic privilege in England, became a Communist, moved to America, and spent her whole life fighting against racism, sexism, and religious hypocrisy. She was as fearless standing up to Klansmen in Mississippi as she was standing up to Brownshirts and Blackshirts in Europe. So it should be very exciting to read the story of her growing up. Jessica had a very large famil Witty and smart -- but maybe a little lacking in heart. So it should be very exciting to read the story of her growing up. Jessica had a very large family, and her sisters were all just as notorious and exciting as she was in different ways. But not all of them were as smart about the world. Diana fell in love with Oswald Moseley, the English fascist, and was ostracized from polite society as a traitor for most of her life. Unity's fate was even more horrific, she fell in love with Adolph Hitler, became a fanatical "Jew-hater" (in her own words) and then tried to kill herself when England declared war on Nazi Germany. In a ghastly accident, the bullet lodged in her head and she became permanently brain-damaged, only to die several years later. Decca is a seriously underrated Mitford sister, and very sadly not my namesake. Her dashing and, at times, melodramatic life story reads like a soap opera; it’s a story of adolescent rebellion. Having opened a ‘Running Away Account’ as a child, at nineteen she eloped to Spain to fight in the civil war and then successfully emigrated to the States without a penny, later to establish herself as a successful journalist. It’s strange to consider that Decca neglects to even mention her time in Nazi Munich, which is a mystery and a real shame; that would have been a very interesting account, coming from a Communist, or as she teasingly dubbed herself, the ‘Red Sheep’ of the family. She’s similarly reticent about the developments in her relationship with Unity, her foaming-at-the-mouth Fascist sister. In fact, the entire memoir is somewhat lacking in emotion or real heart, particularly her relationship with the charismatic Esmond. Similarly, whilst the book is endlessly engaging in her preparations to join the Spanish guerrilla girls, it loses momentum once Decca’s on American soil living hand to mouth. It is, however, startlingly well-written; the economy and acute observation are testimony to her journalistic training. Jessica Mitford was the "Ballroom Communist" of the engagingly eccentric Mitford Family. The second youngest daughter of the 2nd Baron Redesdalee, she had an unconventional upbringing where education was the bare minimum to make a good wife. Always wishing for an escape from her family, be it through schooling or politics or moving to another continent, she suffered through being a deb and presentation before the queen and watching her family come apart at the seems due to adivergence in beliefs Jessica Mitford was the "Ballroom Communist" of the engagingly eccentric Mitford Family. The second youngest daughter of the 2nd Baron Redesdalee, she had an unconventional upbringing where education was the bare minimum to make a good wife. Always wishing for an escape from her family, be it through schooling or politics or moving to another continent, she suffered through being a deb and presentation before the queen and watching her family come apart at the seems due to adivergence in beliefs. But at her first chance she ran off with her cousin, Esmond Rommilly , the nephew of Winston Churchill, to fight Franco in Spain. What with all of England trying to force her home, sending really big ships no less, even the courts of Chancery, it's surprising that she actually was able to succeed in her convictions and in marryingEsmond. The madcap and eccentric life that followed from Rotherhithe to the United States with Esmond equals that of her earlier life, but with herself being the master of her fate. I rarely read biographies. I have to say, if more biographies were as fun and enjoyable as Jessica Mitford's I would read nothing but. The Mitford family has always been fascinating to me, what with the sisters paths being so divergent. Nancy was one of the "Bright Young Things" and a literary darling, with Love in a Cold Climate, which basically skewered her own family for her amusement. Pamela was horse obsessed and kind of out of the limelight. Diana married the heir to the Guinness fortune then divorced him to have an affair with the head of the British Facist party. When they eventually married, Hitler was at their wedding, which was held at the Goebbels' house. She also spent time in prison. Unity was Hitler's biggest fan and when war broke out between England and Germany she failed at committing suicide only to die of meningitis. AndDebo... well she married the Duke of Devonshire and lives at Chatsworth , writes books about chickens and is the last remaining Mitford daughter. You could not make this stuff up! From her earliest days with family to her later life withEsmond, Jessica captures the love she had for these people while at the same time the exasperation of her situation . From hoarding money so she could run away, to the ultimate subterfuge that resulted in her being victorious, even if she had to chase the SpanishConsulate representative all over England and France. To the years scarping by in the States doing anything and everything to stay there, from selling stockings door to door to being a bouncer at a bar. That's right, Jessica, not her husband, was the bouncer. I read this quite hungrily because I needed a Mitford fix and I couldn't get the Sisters bio on kindle. As others have noted there's something a bit flat here and I was surprisingly a bit disappointed. Unity comes across as grotesque but it's never really explored. And the dashing Esmond little better than a smarmy conman in the US. There's a lot of eccentricity, tragedy and adventure but I didn't FEEL it. Este libro me ha enganchado de principio a fin, y he disfrutado mucho con su lectura. La autora nos cuenta su niñez y adolescencia dentro de una familia noble inglesa, caracterizada por la excentricidad de todos sus miembros. Y de cómo aún dentro de ese mundo tan cerrado, ella llega a desarrollar su propia personalidad, y a tener sus ideas, totalmente opuestas a las de sus padres y hermanos. Hasta el punto de tener la valentía de huir de ese mundo para ir a la guerra civil española, y más tarde Este libro me ha enganchado de principio a fin, y he disfrutado mucho con su lectura. It's quite surprising that I hadn't read this book before - as I have become a little addicted to reading about the mad bad Mitfords. This is a really well written, funny memoir from one of those infamous sisters. If anyone asked me who my favourite Mitford was it would be Nancy every time, the most fascinating was Diana, but the one I would have most likely liked in real life - would have been Jessica. Her warmth and likability come across strongly in this book, and she was able to poke gentle It's quite surprising that I hadn't read this book before - as I have become a little addicted to reading about the mad bad Mitfords. This is a really well written, funny memoir from one of those infamous sisters. If anyone asked me who my favourite Mitford was it would be Nancy every time, the most fascinating was Diana, but the one I would have most likely liked in real life - would have been Jessica. Her warmth and likability come across strongly in this book, and she was able to poke gentle fun at herself, at the same time. The first part is hilarious, containing a first-hand description of the goings on at the well known dysfunctional aristocratic family in England between 1920 - 1930's. There were 6 'Mitford sisters', (and one brother) all of them to become famous and/or eccentric. The second, less hilarious but rather interesting, part is about the author, a communist, who manages to elope with Esmond Romilly. They unsuccessfully try to join the fight against the fascists in Spain and eventually end up in the US The first part is hilarious, containing a first-hand description of the goings on at the well known dysfunctional aristocratic family in England between 1920 - 1930's. There were 6 'Mitford sisters', (and one brother) all of them to become famous and/or eccentric. The second, less hilarious but rather interesting, part is about the author, a communist, who manages to elope with Esmond Romilly. They unsuccessfully try to join the fight against the fascists in Spain and eventually end up in the US. I first read this sometime back in the 80s. What was my surprise to find it again under a slightly different title, "Daughters and Rebels", which GR does not recognise (or rather it just leads you here.) Have to admit "Hons" catches the eye more. When I first read this book I knew nothing about the Mitfords, Oswald Moseley, or any of their ilk. "Rebellion" is the active word. Raised in isolation and comfort (servants, etc), all but one of the Mitford girls rebelled in her own way. One turned to w I first read this sometime back in the 80s. What was my surprise to find it again under a slightly different title, "Daughters and Rebels", which GR does not recognise (or rather it just leads you here.) Have to admit "Hons" catches the eye more. When I first read this book I knew nothing about the Mitfords, Oswald Moseley, or any of their ilk. "Rebellion" is the active word. Raised in isolation and comfort (servants, etc), all but one of the Mitford girls rebelled in her own way. One turned to writing as a form of payback, another embraced Nazism, while the author of this memoir chose her romanticised, unrealistic version of Communism. At least Unity found out what Fascism was really about (and apparently approved)--she went to Germany and wormed her way into one of Hitler's upper circles, though having the perfect Aryan phenotype (not to mention the name Unity Valkyrie!) as well as blue blood probably helped there. Being a faux-communist does not inspire Decca to learn to be a contributing member of the worker's society. She doesn't even know how to pick up her own clothes or cook a meal, let alone acquiring any of the usual skills for young women with working ambitions such as typing or shorthand, which even in her class would not have been considered "infra dig", but "rather fun, you know!" Her "artistic" sister returns from London very soon after she achieves permission to go there and study, when she realises she has to clean up her own bedsit and wash her own underwear! Another reviewer mentions the coldness that underlies this story, and I have to agree. While she does speak of Unity as her favourite sister, she is careful to point up that the nicknames "Muv" and "Farve" do not indicate a cosy relationship. I have no idea at what age she wrote this book, but either she was an excellent writer who could recapture the emotional and intellectual immaturity of herself as a young woman, or she just never grew up. She goes from being a perpetually "bored" and sulky teenager who doesn't even enjoy a round the world trip got up for her especial benefit, to being a perpetually clueless wife. Decca and her (also upper-class, public schoolboy) husband play about with ballroom Communism, but even he sees no disphase between his "ideology" and their lifestyle. They eat most of their meals out, and given their lack of marketable skills they spend most of their short married life mooching off others, seeing this as cleverness. They ruin a friend's car and leave it parked on a sidestreet, sighing that "journalists never look after their things." Her husband should know, since he can't even work the expensive camera he charged to his father in law's account at the Army and Navy stores (without the man's knowledge or permission, of course) even before they are married! The Romilly family's solution to all problems seems to be running away. He began by running away from boarding school, setting himself up as a "centre for runaways"--of his own class, of course. The child Decca creates a "running away from home" bank account, and subsequently goes with Romilly to Spain, where they basically sit around; he writes about the people who truly are starving and dying in the streets, while the couple themselves live rent-free in the press hotel and consume "huge greasy" meals of many courses. Back in England, they flee bill collectors (Imagine! You're expected to pay for electricity!) and Romilly tries to set up a gambling den, having one of those "infallible systems" that consumes all her savings in a weekend. When their child dies, they run away from the family's condolences to live in "unreal" Corsica. Then when WW2 begins to loom, they run away to the US, where the mooching continues (and where the narrative begins to bog down). For all her romantic belief that Romilly takes all problems into account before acting, he certainly flounders from one silly get-rich-quick scheme to another, getting "tooken" again and again. More chancer than rebel, his schemes always involve a good amount of freeloading. We won't even discuss their attitude toward the Americans they merrily take advantage of at every turn. Througout the narrative, Mitford's innate sense of superiority to everyone around her, whoever they might be, is a constant. Her family, the English Communist party members, her husbands friends--she's smarter and better than all of them. That doesn't save her from stating on p. 277: There was no doubt it was going to be a dull war, and the absence of the Communists, who annouced they were sticking by their characterisation of it as an "imperialist war" would make it even duller. Fighting in such a war would be an irksome task, dogged by boredom every step of the way, but nonetheless essential. The memoir is chopped short at this point, when her husband leaves for Canada to enlist, having ensconced his pregnant wife in the home of some wealthy Americans (on whom she also looks down) who don't quite realise she is being foisted on them for the duration. One wonders how long the marriage would have lasted if he had returned from the front. Jessica Mitford's dashing and dramatic life story is almost too good to be true from a biography standpoint--and she's so utterly appealing that I think I have a bit of crush on her. Aristocratic and hilariously eccentric upbringing, one of the famous/infamous Mitford sisters (their number including a noted writer in Nancy, not one but TWO Nazis, and a communist--that's Jessica), elopement with her dreamy second cousin and their travels to go fight in the Spanish Civil War, emmigrating to Americ Jessica Mitford's dashing and dramatic life story is almost too good to be true from a biography standpoint--and she's so utterly appealing that I think I have a bit of crush on her. Aristocratic and hilariously eccentric upbringing, one of the famous/infamous Mitford sisters (their number including a noted writer in Nancy, not one but TWO Nazis, and a communist--that's Jessica), elopement with her dreamy second cousin and their travels to go fight in the Spanish Civil War, emmigrating to America on next to no money, romantic slumming around the USA...you really could not make a lot of this stuff up. This is a very romantic book; the relationship between Esmund and her, especially their time on the road in America, is so sweetly portrayed. I really enjoyed seeing pre-war America through their eyes. Also, there is some lovely writing about the importance that books can have on the interior life of bookish children that had me nodding my head in agreement. The book was a ripping story, delightfully told. The only thing I wished was different about it was how oddly light on information it was about some rather important details. The name of the infant daughter who died is never given, for instance; her beloved husband's death in the war is revealed offhand in a footnote; we never find out what happened to Unity, her favorite sister, the fascist and close friend of Hitler, after just surviving her suicide attempt at the outbreak of war between Germany and England. Thank goodness for Wikipedia. I can't believe how moved I was by this book. I'm accustomed to starting to read my next book the moment I finish the previous one, but for some reason I couldn't here. I needed several hours to savour Hons and Rebels. It broke my heart in the strangest way. It's a classic memoir of a classic time, the 1920s and the 1930s, which is one of my favourite periods of history anyway. The characters who wander in and out of Hons and Rebels are a marvel, think Evelyn Waugh, Winston Churchill, WH Auden. E I can't believe how moved I was by this book. I'm accustomed to starting to read my next book the moment I finish the previous one, but for some reason I couldn't here. I needed several hours to savour Hons and Rebels. It broke my heart in the strangest way. It's a classic memoir of a classic time, the 1920s and the 1930s, which is one of my favourite periods of history anyway. The characters who wander in and out of Hons and Rebels are a marvel, think Evelyn Waugh, Winston Churchill, WH Auden. Even Adolf Hitler had something to say about Jessica Mitford! The book would have been enjoyable for that alone. This book reads like a love letter to Esmond Romilly...seen through rose tinted glasses of the past and of a first love. I tried reading this book once before, but struggled to get past the sheer selfishness of both Decca and Esmond. When I first read this book I disliked both intensely, despising Esmond for driving a wedge between Decca and her family, and Decca for being so complacent. However, I recently read the collection of letters between the 6 sisters and gained more respect for Decca. I This book reads like a love letter to Esmond Romilly...seen through rose tinted glasses of the past and of a first love. I have to say that my favourite parts of the book were describing her childhood, to me that was where she sparkled the most. Although I did feel that if she had not acted like a petulant child and taught herself-if she had wanted to learn about things and study further she could have taught herself, my grandmother did that-I also think she would have enjoyed herself more...but I digress this is not a space for me to criticize her childhood. But I love all things Mitford and did indeed enjoy her wit and recollections and can't wait to read other books that the "Queen of the Muckrakers wrote. Regrettably, Jessica Mitford doesn't seem to be much-remembered nowadays. I read The American Way of Death at the urging of the old man in high school (and adored it) -- Mitford was quite au courant then, and was one of those great mid-century writers who sought to revolutionize reportage... the Capotes and the Wolfes and the Hunter Thompsons and the Didions. Although a book like Hons and Rebels, well, it deserves to be remembered. It deserves to be remembered because it describes the exuberance Regrettably, Jessica Mitford doesn't seem to be much-remembered nowadays. I read The American Way of Death at the urging of the old man in high school (and adored it) -- Mitford was quite au courant then, and was one of those great mid-century writers who sought to revolutionize reportage... the Capotes and the Wolfes and the Hunter Thompsons and the Didions. Although a book like Hons and Rebels, well, it deserves to be remembered. It deserves to be remembered because it describes the exuberance of youthful folly so well, the impulse to get out of town, and in doing so to remake the world radically, tramping across France, Spain, and America in the process. Reading and listening to the agonizing news from the Madrid front, the farce of England's "non-intervention" policy, and the barbarous cruelty of Nazi and Fascist forces in Spain, made me feel like a traitor to everything decent in the world. I despised myself for living in the lap of luxury, supported and kept by the very people who were making the "
Reading and listening to the agonizing news from the Madrid front, the farce of England's "non-intervention" policy, and the barbarous cruelty of Nazi and Fascist forces in Spain, made me feel like a traitor to everything decent in the world. I despised myself for living in the lap of luxury, supported and kept by the very people who were making the "non-intervention" policy possible. By turns hilarious and poignant, Jessica Mitford's account of her formative years is a classic. As a member of one of the century's most extraordinary families she has many a tale to tell. Strikingly observant and extremely well written, "Hons and Rebels" manages to convey the flavour of the English upper classes in such a way as to make them likeable. No mean feat. Jessica's memoir is at its best when she talks about her early family life and tells the stories of her sisters. The latter half of the book focuses on her romance with Esmond Romilly, her cousin and Winston Churchill's dashing nephew, who comes across as kind of a conman, initially interested in Jessica for her money. I have to say I'm rapidly falling prey to Mitford mania, to the point where I've spent the last twenty minutes listing call numbers to check next time I'm at the library (i.e. in a half hour or so). Decca's prose is funny and wry, yet straightforward, making this autobiography approachable and quick. I was actually a little surprised by the short length until I realized she stopped the story at about age twenty; then it made sense. The mix of political/historical content with family relationship I have to say I'm rapidly falling prey to Mitford mania, to the point where I've spent the last twenty minutes listing call numbers to check next time I'm at the library (i.e. in a half hour or so). Decca's prose is funny and wry, yet straightforward, making this autobiography approachable and quick. I was actually a little surprised by the short length until I realized she stopped the story at about age twenty; then it made sense. The mix of political/historical content with family relationships and personal development is definitely compelling. I hesitate to say that it "makes 30s Britain/social history/the run-up to WWII feel real," etc., since those have always seemed overwhelmingly real and important to me. Still, seeing the details about this particular very active family gives the situation new context, adding a level of nuance that sharpens my interest. My favorite part about this book was the author's description of her childhood. Her family was delightfully quirky and snobby. I also enjoyed the section about Mitford and her husband selling stockings. However, I did not enjoy most of the parts that involved her relationship with her husband. I have a feeling I would not have liked her husband much. He seemed to have a dilettantish interest in fascism and social justice, and really struck me as being sort of naive and clueless. Didn't enjoy as much as I'd hoped -- apparently I'm not the biggest Decca fan. So many of her exploits with Esmond made me squirm, and the endless parade of "big names" got old. Perhaps my opinion has been tainted by some previous Mitford reading. The best parts were her reflections on the politics of the time, and her discussion of her sisters, of course. On to Debo's memoir! Hons and Rebles is pure gold for anyone fascinated by mid-20th century anti-fascism or wildly eccentric English aristocrats. If for some demented reason those subjects don't appeal to you, you can still enjoy the book for Mitford's fine prose stylings and first class wit. Jessica Mitford is a warm and charming writer, and her fairytale childhood is juxtaposed well against her young adult years fighting in Spain with the anti-fascists. Still, I don't think she ever really delved into the elements of her sisters' characters and personalities that made them so susceptible to fascist ideology, and I find this book slightly superficial in that sense. Anyway, hearing it from the horse's mouth is the way to go. I'm going to have to read some of Nancy's novels next. The best kind of memoir - one whose author can write with real flair and humour, and whose life was truly pretty amazing. I did feel a sense of dislocation in the second half, where Mitford seemed to relegate her role to that as a passenger riding along in the adventures of her husband, Esmond Romilly. Although he was an interesting character too, I enjoyed this section less than her treatment of her childhood and fascinating family. But this is really a wonderful piece of writing. It's hard not to be captivated by this memoir--Jessica Mitford stopped at nothing to follow her dreams, and so is simultaneously both inspiring and shocking. She was smart and funny, but seemed to give little thought to how her out of bounds actions and petty larcenies would affect others. Her sisters took issue with some of her facts, and there is a too-good-to-be true quality to parts of the book that's completely forgivable because without them the book wouldn't be as lively or fun. It's maybe telling that, as Jessica reports, her husband regaled some their new American friends with truth-embellished versions of their adventures--to improve the stories, she says. There is a fascinating inner reflection in the last few pages where Jessica admits that though she and her young husband, Esmond Romily, believed they were entirely "self-made", free agents who had totally escaped any taint of their English aristocratic upbringing, their impatience, carefree intransigence, and supreme self-confidence could be easily traced to their backgrounds. Jessica Mitford ends this mainly happy book before her husband dies while fighting in World War Two. The book is also called Hons and Rebels. A great read. Jessica Lucy Freeman-Mitford was an English author, journalist and political campaigner, who was one of the Mitford sisters. She gained American citizenship in later life.